Roses bloom the best in full sun. Choose a location with at least 6 hours of sun per day. Morning sun is more kind to the plant. Rich, sandy loam is the preferred soil for roses. Amend difficult soils with humus, or consider building up the beds to ensure good drainage. Roses will not tolerate soggy, wet roots. Allow ample space between plants for good air movement. This cuts down on diseases. Avoid the root competition of nearby large shrubs and trees. Provide a slow, deep soaking with each irrigation. Sandy soils require more watering than clay soils. Hot temperatures should prompt more frequent irrigation. Only wet the foliage in very early morning hours. A thick layer of good organic mulch serves to discourage weeds, cool the soil, conserve water and encourage earthworms. Do not fertilize new plants until the growth is 4 to 6 inches long. Using a balanced fertilizer, begin feeding in half the strength recommended on the package label. As the plant matures, increase the level to full strength. Fertilize after each flowering cycle. Stop all feeding prior to the winter months. Consult your nursery for recommended sprays in your area. A dormant spray applied during the dormant season is of great help. Apply insecticides only when insects are present. Use all chemicals strictly by the label instructions. Removing spent blooms will encourage more flowers. Prune dramatically in early spring, after the danger of frost has passed and before new growth has begun. In harsh climates, fully cover the plant to protect from frost and wind damage. Remove the cover after the danger of frost has passed. Select a location in the garden that best fulfills the requirements given in our Rose Basics. Dig a hole large enough to easily accommodate root structure. In cold climates, position the graft knot/crown 2 to 3 inches below ground level (see illustration below). 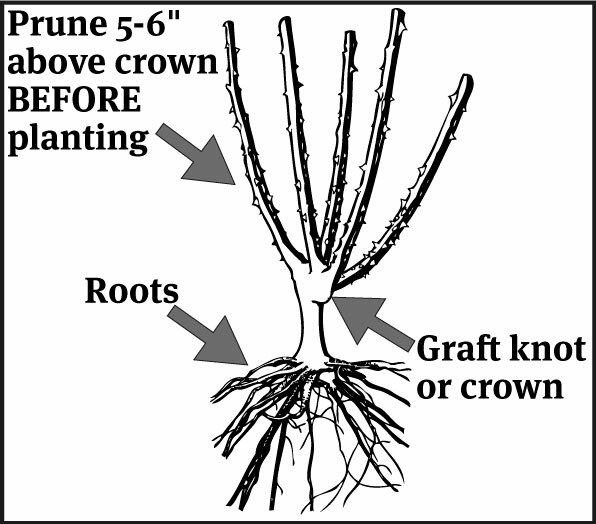 In mild climates, position the graft knot/crown right at ground level. Amend the soil going back into the hole with well-rotted compost.Then place a small ‘hill’ of amended soil at the bottom of the hole. Use your pruning shears to balance the length of the canes to the length of the longest root. This may seem to be a severe cut, but it helps greatly in the transplant. Place the plant at the proper height in the hole, and fill two-thirds full with the amended soil. Using a gentle stream of water, fill the remainder of the hole. As the water seeps in, it will moisten the roots and surrounding soil, removing any air pockets. After the water has completely settled, fill the hole to the top with the remaining soil. Sprinkle lightly with water to assure good moisture. Click Here to download PDF for Bareroot Roses Care Instruction. 1. Prune canes to 4” to 6” (Patio/miniature varieties OK to 3 inches). This is critical for optimal plant performance! 2. Use sharp, clean blades to prune rose canes to avoid introduction of disease and pests. 3. Remove any shriveled, small, or dead canes. 4. Refer to the illustration for location to prune for best results.